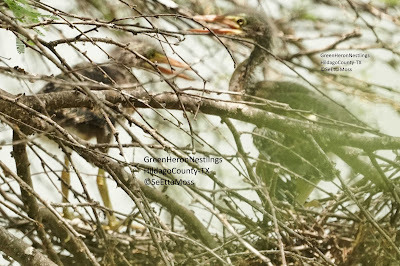 While birding yesterday I spotted these two Green Heron nestlings. They looked almost grown and ready to fledge so I was especially careful to not inadvertently cause them to fledge prematurely, a risk with birds close to fledging. So I only used the setting on my camera that allows pics without any clicks and carefully took a few pics then backed away to avoid walking close to their view. I do not publicly divulge the location of nesting birds at high risk like these so I am only posting the county in which I photographed them. The apparent mother Green Heron, shown below well hidden, was perched close by the nest. 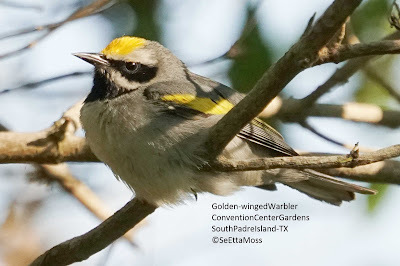 This male Golden-winged Warbler was seen today at the Convention Center Gardens at South Padre Island, TX. 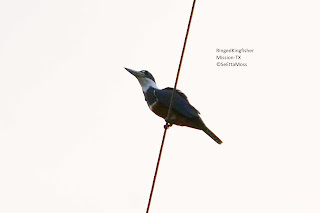 It perched in the shade of the trees for more than 5 minutes allowing great views, many still pics and a little video. This little warbler likely just arrived on this barrier island after migrating across the hundreds of miles of the Gulf of Mexico. Sadly it appears to have lost most of one leg. The warbler is basically sitting on the branch rather than standing on it as many birds do, likely due to having only one whole leg. In the bottom two pics the remaining leg stump is visible and it has some twisted piece at the end maybe indicating a recent injury. 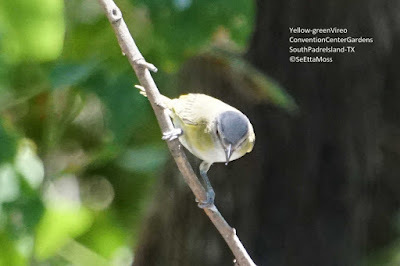 Golden-wingedWarbler on South Padre Island, TX from SeEtta Moss on Vimeo. 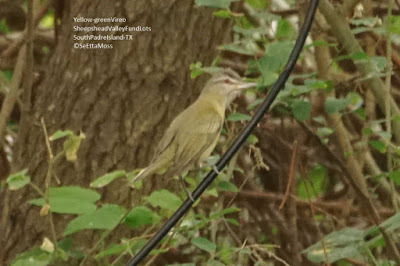 As I was driving out to South Padre Island I saw a facebook post that a Yellow-green Vireo was being seen at the Sheepshead Valley Fund Lots there. As this is rare bird that only ventures into South Texas I was very interested and wanted to get there quickly--first I tried to take a short cut that turned to be a closed road then wouldn't you know a local sheriff's deputy pulled onto the highway in front in me for a distance. I did make it without a ticket to the birding hotspot and spotted this bird. This was a difficult id for me as this species is very similar to Red-eyed Vireo but a local birder who has seen this species before confirmed it from my photos. Can you see all 3 owls in this tree? 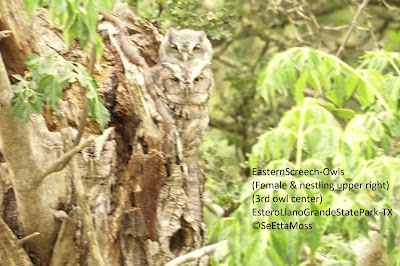 This enlarged pic just above is not as sharp as below but it better shows the 3 Eastern Screech-Owls in this tree. This is in Estero Llano Grande State Park and this is same tree that I took the photo of the baby owl inside the nest hole about 2 weeks ago. These owls can be hard to find so look at pic below to see the location of each of the 3 owls. This is one productive tree--in addition to all the nesting owls there is also an Golden-fronted Woodpecker nest in it. Wish I could have gotten sharper pics as these were hand held from about 40 feet away in poor light. I went back twice including yesterday and carried my tripod so I could get better shots but I think the owls have fledged. The pic above shows another photo of this tree showing an Eastern Screech-Owl on the left side of the tree and another on the right side of the tree. I photographed the tiny ducklings and mom above at Estero Llano Grande State Park . 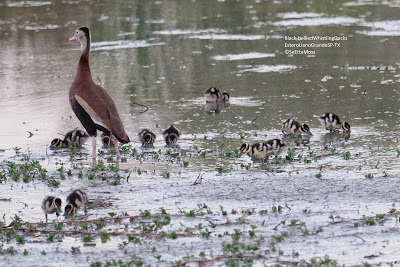 They are Black-bellied Whistling Ducks, a species only that are found in a few southern states in the U.S. but in Mexico, Central America and all the way well into South America. They both perch and nest in trees and not uncommonly perch on overhanging wires. Their name fits their frequent calls that include a whistling sound.